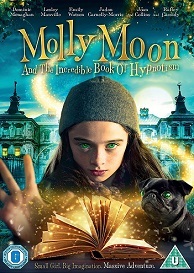 Molly Moon And The Incredible Book Of Hypnotism on DVD December 5th And to celebrate we have a great competition for you and 3 copies on DVD to give away. Christopher N. Rowley co-writes and directs this children's fantasy adventure adapted from Georgia Byng's novel. After discovering a magical book on hypnotism, orphan Molly Moon (Raffey Cassidy) uses its powers to escape her glum orphanage life and travel to London in search of her friend Rocky (Jadon Carnelly-Morris). With the bright lights of the city quickly causing a distraction, Molly soon deviates from her quest and mesmerises her way into the lead role of her very own musical, becoming a singing sensation overnight. Trouble is not far away however, as Molly's new-found fame attracts the attention of bungling criminal Simon Nockman (Dominic Monaghan), who attempts to steal the magic book to use as part of his latest robbery scheme. The cast also includes Emily Watson, Joan Collins and Omid Djalili.